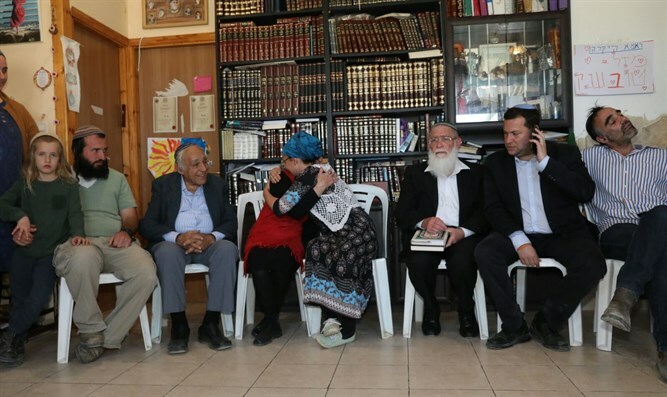 The widow of Rabbi Raziel Shevach, Yael, received news of the official approval of Havat Gilad from the head of the Samaria Council, Yossi Dagan, with whom she sat during the government meeting. Also tehre were Havat Gilad chairman Shalom David Man, and Moshe and Itai Zar, who established the community. The message was delivered to the group via telephone by Minister Miri Regev (Likud). Yael said in response, "It's a shame that we have reached this day. But if we are already there, then I am glad we are able to get the most comforting answer we can from it. Raziel would certainly have said that the Hallel prayer [recited to commemorate days of national salvation] should be said, and that this is how redemption looks. " Itai Zar, one of the founders of the community, added, "I am very happy and excited. We are not forgetting Gilad [Zar, who was murdered in a terror attack and after whom Havat Gilad is named] or Raziel. I am sure that Raziel is happy and smiling now. We always believed that Havat Gilad would, one day, be an official community. And we are proud of our government for taking this step. "